A bracelet that's unique and will attract much attention is easy to make if you know how. 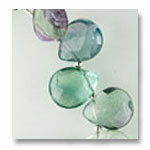 Learn to make one-of-a-kind gemstone or beaded jewelry by following some of the techniques here on this jewelry making instructions website. Scroll down for a list of how-to projects. You can keep your design as easy as just a strand of beads stringed onto a piece of nylon coated wire or jewelry making elastic. It can also be elaborate gemstone jewelry pieces that require an intricate bead pattern and some detail beadwork. Other complex designs include metal cutting, stone setting, torch or kiln firing and soldering. Start with a easy design like a simple bead bracelet with a simple clasp and when you are comfortable with your skills, proceed to make more complicated pieces. We will include bangles in this section of the website. To make your own bangle, you can buy readily available silver or non precious metal bangles from jewelry making stores and add your own beads. You can also make one from a sheet of metal or precious metal. This will take more time but you can cut it to different width and design. Make this lovely pearl jewelry for your wrist. You can make it in less than an hour. 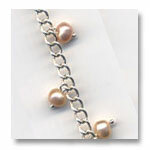 This piece uses fresh water pearl beads attached at regular interval to a silver chain. I love this faceted green fluorite quartz piece. It's so versatile - you can wear it with your pair of jeans or show off at a dinner party. Look great on your wrist. 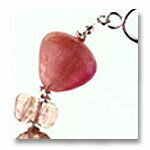 This is an inexpensive charm jewelry for the wrist that you can easily make for a fashion conscious teenage girl. 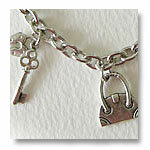 Eight lovely fashion charms dangle from this piece of jewelry. This Chinese lotus crystal bracelet is made according to the Lotus Bead Pattern provided with this how-to project. The crystal beads when strung together look so much like a lotus. 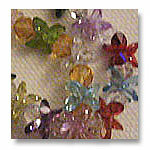 All you need for this project are colored crystal beads and a piece of jewelry making elastic. Make this gorgeous piece of gemstone jewelry using watermelon tourmalines and silver nuggets. No watermelon tourmalines in your gemstone collection? No problem! Just replace these with whatever beads or gems you have. Create this beautiful bouquet of a beaded bracelet with glass beads, seed beads of various colors and designs. 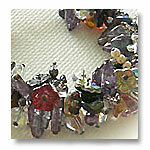 I have made many bracelets and other gemstone jewelry. But I'm not able to show you all of them because my friends and family members snatched them up as soon as I made them. When I begin to build this jewelry-making-instructions.com website, I regret very much that I did not take photographs of these creations. 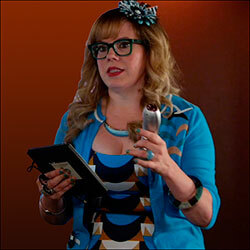 So I hope that you will remember to take snapshot of every piece of jewelry you created. One day, many of your jewelry pieces will be given away as gifts or even sold to friends. It is good to keep a journal or a photo album of your original pieces, and note beside each the measurements and jewelry making supplies used, so that it will be easy to reproduce them again when required. Don't believe that you can make a profit from jewelry making? Soon people will known about your jewelry making skill. Then friends, family members and all, will flock to you to buy your handcrafted jewelry. Click here to find out more about selling your jewelry online. I have included pictures of the jewelry pieces in each project with hand-drawn sketches for some difficult to explain instructions. All these aids are to help make your learning experience seamless and more enjoyable. Do bookmark this website because I'll be adding more and more gemstone jewelry pieces to this and other sections of this jewelry-making-instructions.com website.